5:41 AM low -1.4 ft.
11:56 AM high 11.3 ft.
6:02 PM low -1.0 ft.
How to reach: To reach the water level station from either direction of U.S. Interstate 93, take exit 23 and follow the signs to the Financial District. Proceed south on Surface Road until it becomes Purchase Road at the intersection with High Street. Continue south on Purchase Road for about three blocks. At the intersection with Congress Street, turn SSE (left) and then NE (left) onto Atlantic Avenue. Proceed on Atlantic Avenue for one block to the intersection with Seaport Blvd, proceed straight and after the James Hook & Company building turn SE (right) to Northern Avenue and the U.S. Coast Guard Building. 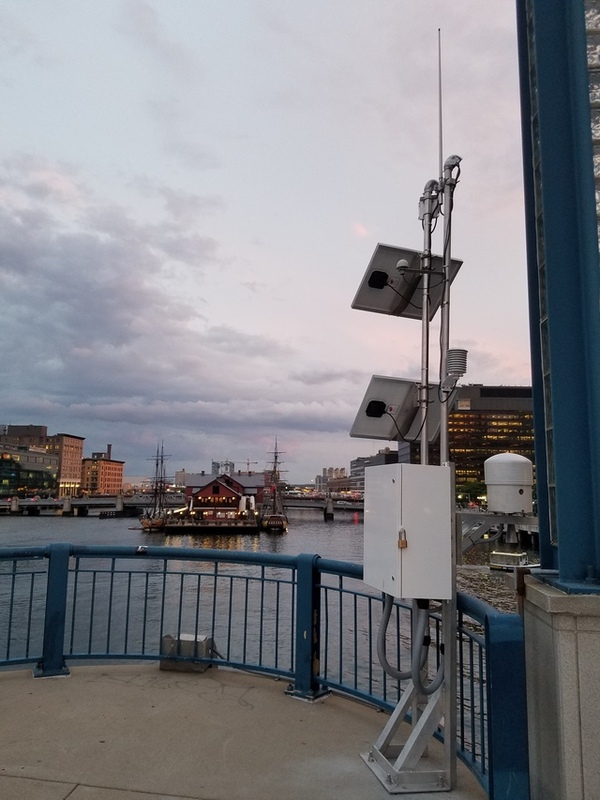 The water level station is SE of the U.S. Coast Guard Building at the NW end of the Northern Avenue bridge. The bench marks are in the vicinity of the U.S. Coast Guard Building, Marriott's Custom House, and the U.S. Post Office.